The original family de Gramont descends from the Basque prince Andeca, Duke of Cantabria, who died in the battle of Guadalete against the Arabs in 711, together with the last King of the Visigoths. 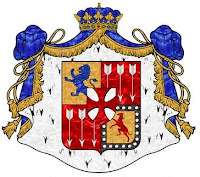 Andeca´s son Lopo became Duke of Gascony. Aner Sancho, a younger son of Sancho Garcez Duke of Gascony (+ 955), became Viscount of Oloron, and his grandson Arnoud Loup Viscount of Dax. Arnoud Loup´s grandson Bergon Garcie, mentioned in 1040, is the first lord of Gramont. Around 1200 the lords of Gramont acquire the lordship of Bidache. The family dies out in the male line in 1528. Heiress Claire de Gramont married Menaud d'Aure, Vicomte d'Aster. Their son Antoine I (1526-1576) takes the surname Gramont and is created Comte de Gramont and Guiche in November 1563. He declares in 1570 the principality of Bidache sovereign. This ends on 16-4-1790, when Bidache attaches itself to France. Antoine II Comte de Gramont (1572-1644), governor-general of Navarra, is created Duc de Gramont on 31-12-1643. The family d'Aure descends as well from Andeca, through Asnar Sanchez, a younger son of Sancho López Duke of Gascony (+ 816). Asnar´s grandson Aznar became Count of Comminges in the second half of the 9th century. Guy, a younger son Bernard Count of Comminges, married ca. 1160 Bertrande Viscountess of Aure, starting a new line of Viscounts of Aure.